Since 2009, the city of Leipzig has been commemorating the miracle of the Peaceful Revolution every year on November 9, that started from the Saxon metropolis and made a significant contribution to the fall of the Berlin Wall on November 9, 1989. 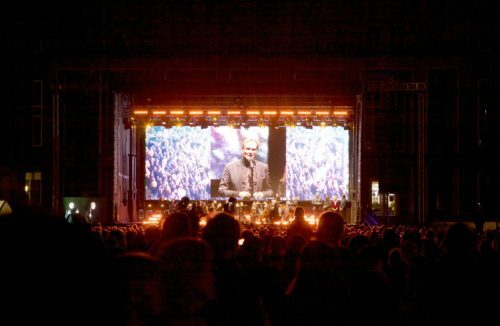 As in previous years, again more than 15,000 people gathered on November 9, 2018, on the Augustplatz between the Gewandhaus and the Opera. On behalf of the Leipzig Tourism and Marketing GmbH (LTM), ils medientechnik GmbH once again assumed overall responsibility for all technical support. After ils had successfully implemented the large-format LR28 line array of the Dutch manufacturer Alcons Audio at a major event in the autumn, managing director Thomas Ils again opted for the “big silverware” at LichtFest. The main stage was placed in front of the opera, where a moving synthesis of sound, spoken theater and speeches was artistically realized. The staging focused on women this year. The idea was consistently implemented by the artistic director: Conductor Eva Meitner conducted the Free Orchestra Leipzig, consisting exclusively of female musicians and founded for the occasion. Only works by female composers were performed with one exception. Actresses and contemporary witnesses conveyed the female perspective on the events of autumn 1989 and the role of women in the civil rights movement. The performance was mainly based on classical live music, which was artfully interwoven with different language contributions. In addition, also recorded music and pre-produced video content was to be integrated. The Leipzig event technology specialist ils medientechnik was responsible for the entire technical implementation and supplied all necessary equipment. In addition, the team led by the managing directors Thomas and Mario Ils also supplied the technical advice for the artists. For the sound system, ils is convinced by Alcons Audio. 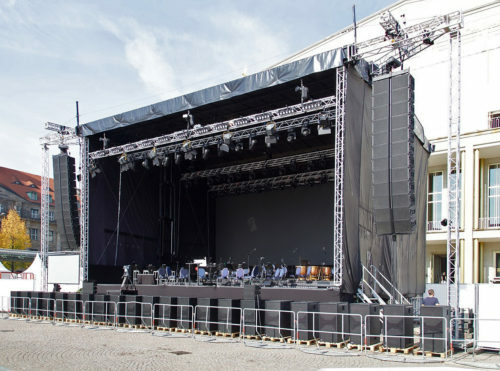 At the Festival of Lights in Leipzig, the main-PA hangs consisted of 2x 12 Alcons LR28, the large-format pro-ribbon line array system. 20 Alcons BC543 subwoofers provided the low-frequency support. In addition, ils deployed 12x VR8 for monitoring and 8x LR14 pro-ribbon line array systems for the near field. 18x Alcons LR18, the smaller brother of the LR28, was used for the delay, which was laterally expanded with 4x Alcons QR24/110 line source systems. The client was also more than satisfied with the overall impression of the performance and the high-resolution sound in particular. Uwe Biesgen from Creativsound in Berlin was responsible for the FoH mix. The LR28 system was easily leased by ils medientechnik from the Alcons rental network “The Ribbon Network”. More information on www.ils-medientechnik.de .